Designed for use with Definiy. Ringer Volume Control - 3-position switch to control the volume for the tone ringer. Message Light - Red flashing light for message waiting. Hold Button - For putting call on hold (activates LED). Redial Button - For redialing the last number you dialed from the dial pad or from programmable dialing button. Flash Key - For using features such as conference. 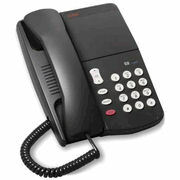 Handset Volume Control - Used for raising or lowering the volume of the handset when in use. Data Jack - For connecting a device such as a modem to your telephone.